Lipodrene by Hi-Tech Pharmaceuticals – If the Goal is Weight Loss! We are happy to present one of the best fat burning supplements ever created! Hi-Tech Pharmaceuticals is well aware that it’s not an easy task to keep a proper diet, maintain a dedicated fitness program, and get the necessary supplements to reach your objectives. It’s especially true when we are getting older and life troubles get in the way. It’s quite important to choose the right supplements allowing you to reach and maintain the body weight you desire. It doesn’t really matter whether you are a professional bodybuilder, a housewife, a businessman, or a student. In any case, you actually want to look good and feel good, don’t you? Lipodrene can help you make your dreams a reality! Lipodrene is an energy supplement facilitating your weight loss effort. It has been the bestseller for many years. It really sets the bar in the weight loss supplement production industry. 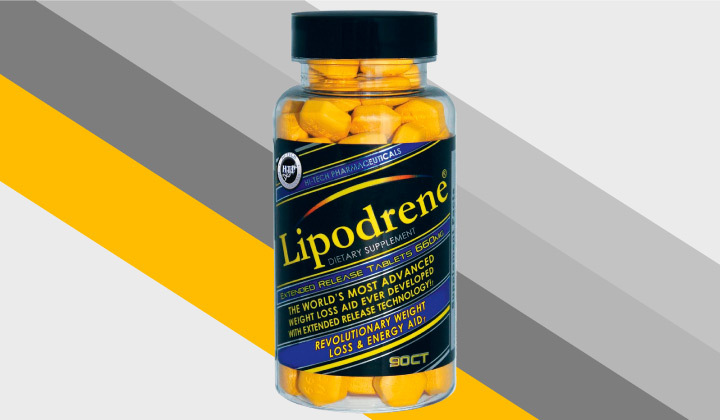 There is no other weight loss supplement which can provide at least similar results the way Lipodrene does. People who have ever tried to lose extra weight perfectly know the yellow hexagon tablets which are sold in all the best supplement and health food stores all over the world. We can safely call the supplement the flagship fat burner or even the gold standard in this regard. Why is it so? Because it’s the only fat burner which really works to help you reach your weight loss objectives. Where to buy “Lipodrene Without Ephedra & DMAA” ? How Does Lipodrene Affect Your Body? What’s good about it? If a supplement like Lipodrene has a good reputation, there is a reason for that – it actually works the way we expect it to work! Hi-Tech Pharmaceuticals Lipodrene has been the flagship fat burner for years. It has multiple versions, and each of you will find a certain formula suitable right for you. This Lipodrene version is Ephedra FREE. Even without Ephedra, it does contain other stimulants to provide you with the same good results as the original supplement. In addition, as there is no Ephedra, you may no longer worry about crashing or jittering issues! The supplement will speed up your natural metabolism and help you burn fat, maintaining your lean muscles as they were. You can also consume your favorite meals even if they are carbs or sugar! In other words, you will feel that the fat comes right off your body even if you keep to your regular diet and exercise. Acacia Rigidula Extract was added to the supplement instead of Ephedra. Acacia rigidula extract is obtained for a shrub plant found in Texas and related to Ephedrine. The plant contains multiple ingredients which help you lose extra weight: Phenethylamine and Nicotine to name a few. The extract efficiently helps you suppress your appetite as well. We will describe some other compounds below. Citrus Aurantium Extract, which is also called Bitter Orange, works well for appetite suppression and helps consumers lose weight. Bitter Orange contains a component which is called P-Synephrine. It works similar to adrenergic agents and favorably affects your metabolism. Extracted from the cacao plant, Theobromine is a bitter alkaloid which works as a vasodilator. It expands your blood vessels, keeping your blood pressure within normal parameters and can be also used as a diuretic. Green Tea Extract is obtained from the green tea plant. It helps your body to stay alert and suppresses hunger sensation, promoting fat loss. Isopropylnorsynephrine HCL is a powerful lipolytic agent that boosts your energy and keeps your spirits high. It’s exactly this compound that ensures your overall well-being. Hoodia Extract is obtained from the Hoodia cactus. This plant is found in South Africa. It provides your body with energy but promotes weight loss. Cassia Nomame Extract is actually obtained from a Chinese medicinal herb. It promotes the natural urine flow and prevents your stomach from absorbing fat, thus facilitating weight loss. Hi-Tech Pharmaceuticals recommends you to take 1 to 2 tablets in the morning on an empty stomach and then 1 more tablet right after lunch. Never take more than 4 tablets within the 24-hour time period. You can take the Lipodrene supplement for 4 to 8 weeks and then make at least 4 weeks break. This product is suitable to take by both men and women.